“What the heck has happened to the Democratic Party?” said Frank Pavone in WashingtonExaminer.com. Democrats have always had an extremist fringe of wannabe “revolutionaries,” but in recent weeks, the party’s leaders have also sounded like radicals. Hillary Clinton last week defended the harassment of Republican senators during the confirmation fight over Supreme Court Justice Brett Kavanaugh, saying, “You cannot be civil with a political party that wants to destroy what you stand for.” Not to be outdone, former Attorney General Eric Holder called on liberals to replace Michelle Obama’s famous maxim “When they go low, we go high” with the more aggressive “When they go low, we kick them.” Holder claims he wasn’t being literal, said David Harsanyi in TheFederalist.com, but Democrats really are acting like “a mob.” In recent weeks, leftists have hounded Sen. Ted Cruz and his wife out of a restaurant, pounded on the doors of the Supreme Court to protest Kavanaugh’s confirmation, and harassed anyone wearing a MAGA hat. Obviously, liberals are so frustrated by their lack of political power that they’re turning to threats and physical intimidation. What “disingenuous nonsense,” said Greg Sargent in WashingtonPost.com. Clinton and Holder didn’t advocate violence; they called on Democrats to use “harder-edged’’ but legal tactics to defend democracy from a Republican Party with no scruples left whatsoever. The GOP stands united behind an authoritarian president who repeatedly urged violence against protesters at his campaign rallies, who threatens political opponents with jail, and who regularly uses Twitter and raucous mob rallies to harass and belittle anyone, especially women and minorities, who dares challenge him. Let’s not forget that Trump caged kids like animals after tearing them away from their parents, said Sarah Jones in NYMag.com. Or that he heartlessly mimicked and mocked Christine Blasey Ford’s somber testimony that Kavanaugh sexually abused her. And you want Democrats to respond with “better etiquette”? “Legally protected protest” is the proper response, said David French in NationalReview.com. But there is a “yawning legal and moral gap” between Trump supporters chanting “Lock her up!” at a controlled political rally, and a mob chasing Cruz out of a restaurant, surrounding senators on elevators and hallways, or disrupting the Kavanaugh hearings with shouting and histrionics. 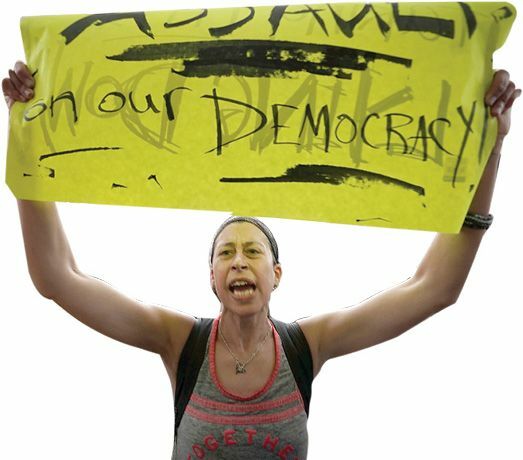 There is simply “no place for the mob in a constitutional republic.” Democrats have convinced themselves that the current president, Congress, and Supreme Court are all “illegitimate,” said Rich Lowry in Politico.com. That kind of thinking fuels violence—and is more dangerous to our democracy than Trump.